Adrafinil is a nootropic or smart drug and part of a class of drugs called eugeroics (meaning ‘good arousal’). This antidepressant supplement and stimulant, previously known by the brand name Olmifon manufactured by Cephon Laboratories, is able to boost a person’s mental alertness without disrupting their normal sleep pattern. Unlike other stimulants such as coffee, Adrafinil does not cause the same unpleasant side effects, for instance, agitation and insomnia. Along with its impressive antidepressant action, a sense of mental alertness and increased energy levels are noted by users. Adrafinil has been used throughout Europe for decades as an effective narcolepsy treatment. Narcolepsy is a condition that causes excessive daytime sleepiness, but those taking Adrafinil report a noticeable improvement in mental performance as well as an increase in energy levels. In healthy people, Adrafinil enhances mental clarity, alertness, concentration and memory. The beneficial properties of this drug are built up over a period of time, this means it can give a gentler and more subtle boost to the system. What is unique about Adrafinil? Conventional stimulants, from coffee to methamphetamine stimulate a broad range of receptors in the brain, which is believed to be why they commonly cause effects such as anxiety, agitation and sleeplessness. Unlike other stimulants Adrafinil only stimulates selected adrenergic receptors in the brain, these are the receptors that respond to norepinephrine, the neurotransmitter associated with mental alertness, learning and memory. This targeted approach is thought to be the reason that Adrafinil has virtually no side effects. This lack of side effects coupled with its unique ability to stimulate only when the user requires stimulation sets Adrafinil far above all other stimulants. 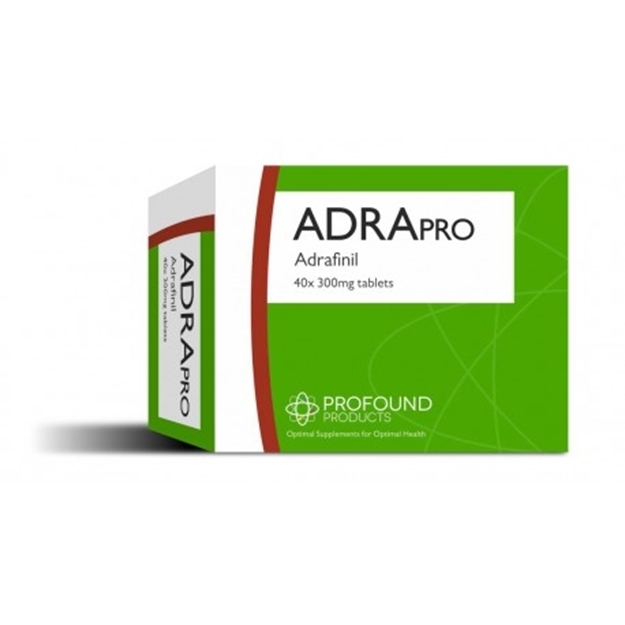 Our Adra Pro – originally known as Adrafinil mirrors the original Olmifon Adrafinil pack of 40 x 300mg tablets, a normal dosage of Olmifon / Adrafinil is one or two 300mg tablets twice a day. However if you intend to take Adrafinil continuously we would recommend having a liver function test, every 3 to 6 months, This is because long-term use may occasionally result in elevated liver enzymes. If this happens simply lower the dosage or stop using altogether until your liver enzymes return to normal. Since Cephon Laboratories withdrew the Olmifon brand in 2012 many versions have become available but for your safety and to ensure you are taking the genuine formula we would always advocate only buying from a reputable, known source such as Antiaging-systems.com. What is the difference between Adrafinil and Modafinil? Adrafinil is the earlier analogue to Modafinil, in other words, Modafinil was created from adrafinil. It works in the same way as Modafinil i.e. targets alpha-1 brain receptors and makes them more responsive to noradrenaline. Adrafinil is not as specific or potent as Modafinil, but given the expense and difficulty of obtaining modafinil, adrafinil is a good option. Adrafinil may occasionally cause headaches, stomach pains and skin irritations, and in certain cases, inner tension. Testing of this product has been carried out only on elderly users. The preparation contains an active ingredient, which could induce a positive result in anti-doping tests for athletes. If you suffer from epilepsy, or serious hepatic or renal disorders, consult your doctor before taking this product. Long-term use has also been associated with occasional instances of elevated liver enzymes, specifically SGOT, SGPT, GGPT and hepatic alkaline phosphatase. Thus, if you plan to use Adrafinil for an extended period of time, you should have your liver function tested to establish a baseline, and then after 3 months and again every 6 months thereafter. If abnormalities appear, reducing the dose or stopping the drug should permit a return to normal. Description: Adrafinil stimulates alpha-1 receptor sites to noradrenaline helping to improve focus and attention and alleviating tiredness during the day. Directions: Take 1 capsule once or twice daily or as directed by your physician.